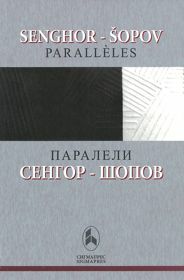 Jasmina Šopova : Senghor-Šopov : Parallèles (Senghor and Šopov side by side), Skopje, Sigmapres, 2006. This bilingual book (French-Macedonian) was published on the occasion of the Senghor Year in Macedonia in 2006. It contains forty eight poems by Senghor and by Šopov that are intertwined, weaving sometimes discrete yet infrangible links. Written over a period of forty years, most of them at a time when the two poets didn’t know each other, these poems reveal the deep connection between the two authors. Jasmina Šopova’s introduction is available here. The illustrations are by Hristijan Sanev. Information on the book’s promotion is available here.